This is part two in a five-part series about the comprehensive urban plan being implemented in Barcelona, Spain, which would reclaim more than half the streets now devoted to cars for mixed-use public spaces, or “superblocks.” This reporting project was supported by the Kleinman Center for Energy Policy at the University of Pennsylvania, where the author, David Roberts, is a senior fellow. Inside the superblock in the Poblenou neighborhood, in the middle of what used to be an intersection, there’s a small playground, with a set of about a dozen picnic tables next to it, just outside a local cafe. On an early October evening, neighbors sit and sip drinks to the sound of children’s shouts and laughter. The sun is still out, and the warm air smells of wild grasses growing in the fresh plantings nearby. 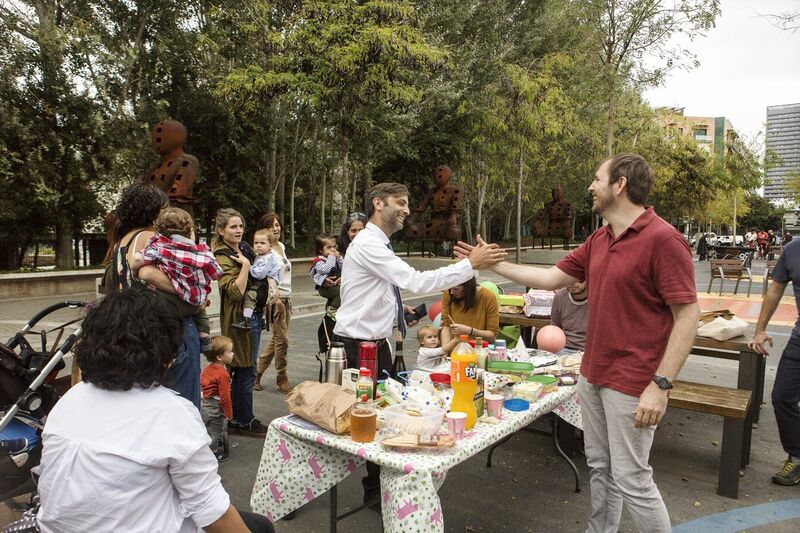 In the Poblenou superblock, on a street once reserved for cars, neighbors gather for a birthday party on October 14, 2018. 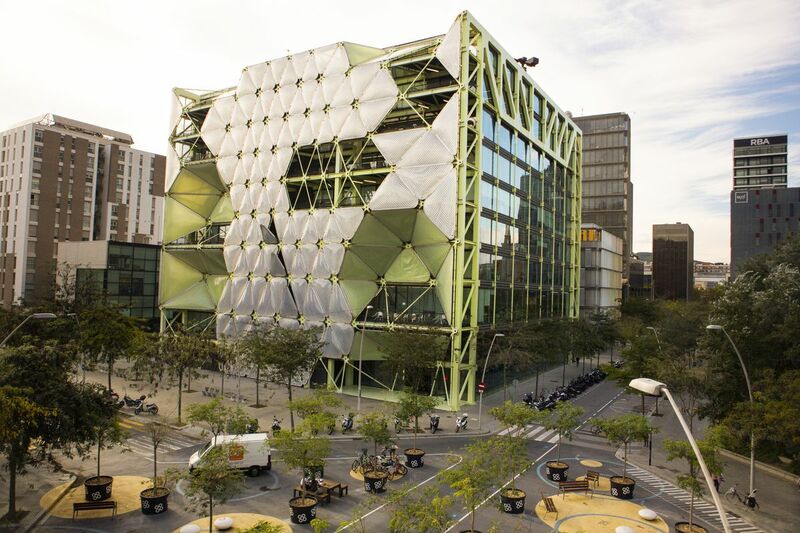 Technically speaking, the Poblenou superblock is Barcelona’s fourth. But it was the first built as part of the city’s new urban plan — the first of what are intended to be dozens, eventually hundreds, in coming years. The Poblenou superblock, in geographical context. It is not as polished as the superblock around the Sant Antoni market, which came two years after it. It is somewhat rough around the edges, with construction fencing up in several spots and rows of potted trees giving it a homemade, low-budget feeling. 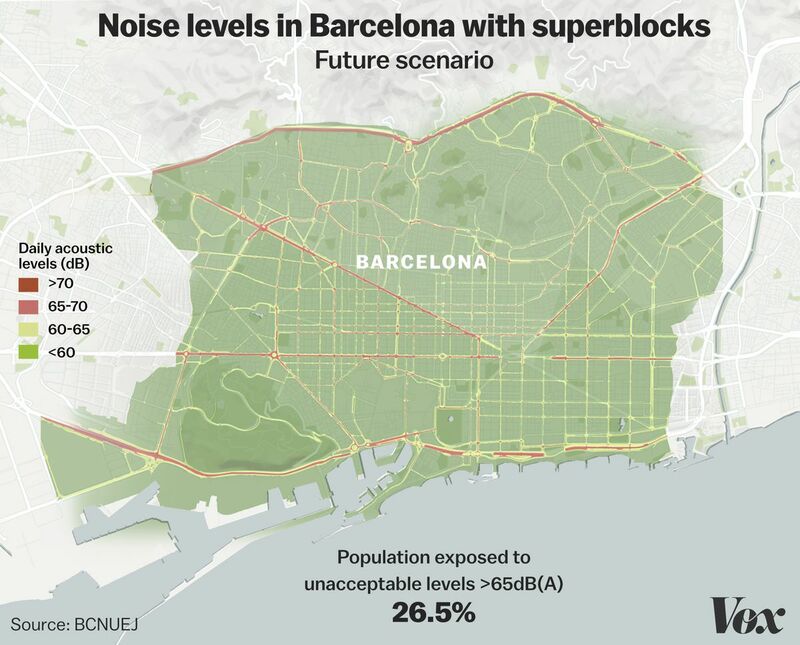 But in many ways, it is a better representation of the changes that Barcelona’s urban plan will spur in the city. It is still new public space, malleable, in the process of being shaped by residents to their needs. It is this sort of small-d democratic placemaking that the superblocks plan is meant to encourage. 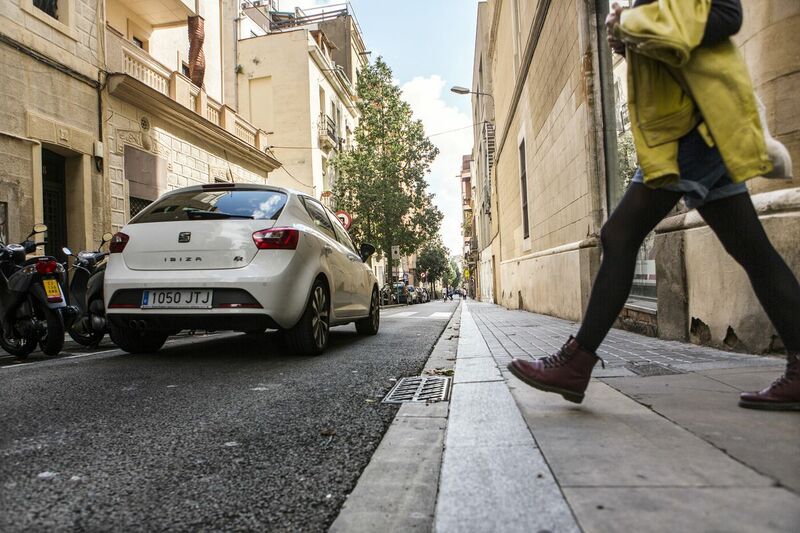 The story of the Poblenou superblock casts light on what it takes to push and cajole Barcelona’s urban reforms around the initial resistance to loss of vehicle space. But putting Poblenou in proper context requires a brief history of the superblock program. 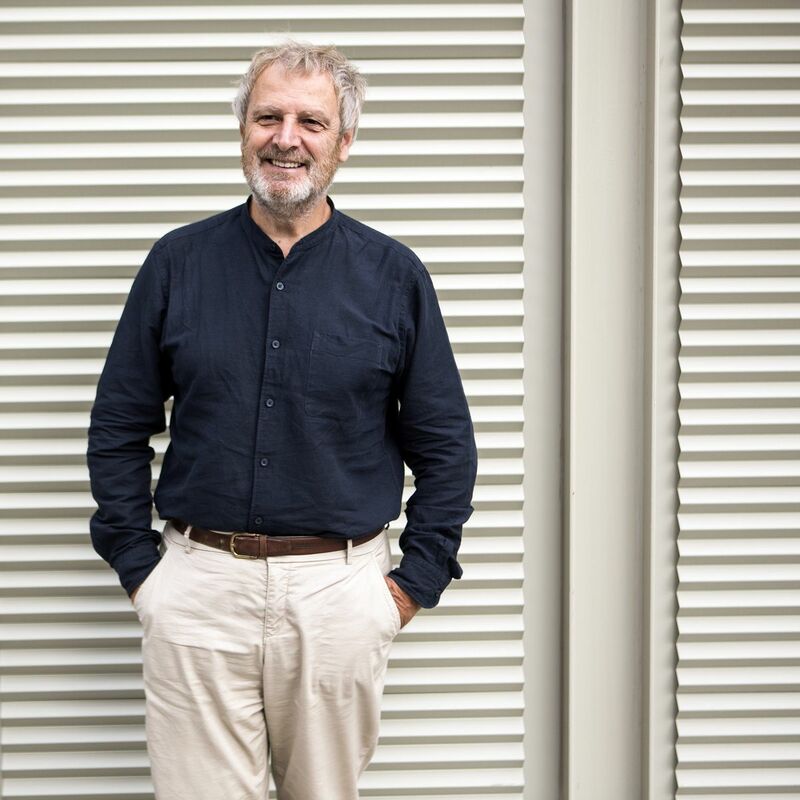 Salvador Rueda, Barcelona’s resident urban visionary and head of the Urban Ecology Agency of Barcelona, was on the city council in the mid-1980s, directing its environmental work,when he designed a study of the noise in Barcelona. He wanted to see what it would take to get it down to the internationally recommended level of around 65 decibels. 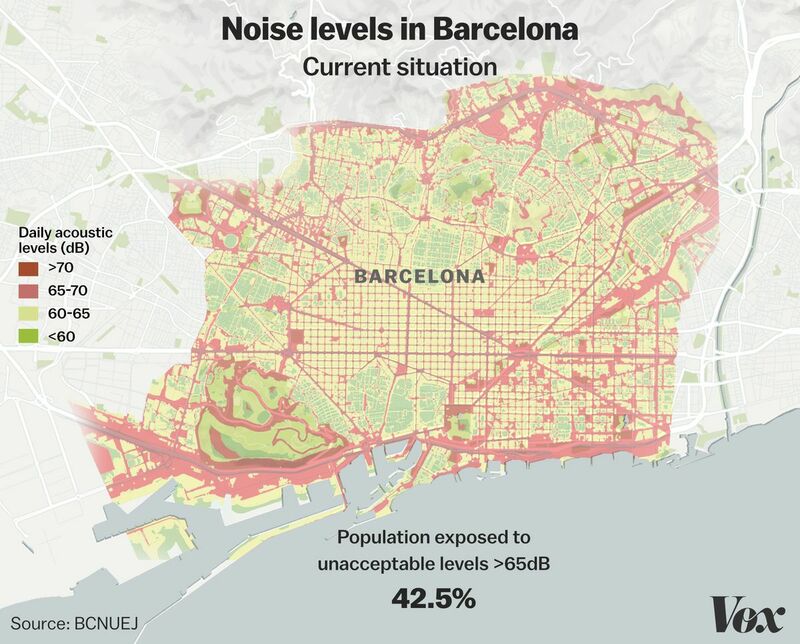 Lots of Barcelona residents live with unhealthy levels of noise. That is when Rueda first began envisioning superblocks. The basic idea of a superblock is to delineate a large area of roughly three-by-three blocks as shared-use space, with bicyclists, pedestrians, and people who simply want to sit at picnic tables in the street given equal priority to cars. Nonresident automobile through traffic is excluded. Superblocks will bring noise to tolerable levels across most of the city. At the time, Born, part of the Old Town, was rundown and crime-ridden, but it quickly gentrified and has now been colonized almost entirely by boutiques and lavish hotels. The kinds of shops that provide for the daily needs of middle-class occupants have been pushed out. Public spaces are mostly dominated by tourists. Superblocks two and three didn’t come around until 2003. They are both in the neighborhood of Gracia, a few blocks from each other. There was some initial resistance to the superblock plan in Gracia, but it faded quickly; the neighborhood was particularly well-suited to pedestrianization. It was a separate village, Vila de Gràcia, before being swallowed by Barcelona in the 17th century, and its narrow streets were already popular with tourists, who were herded onto tiny sidewalks. In the Gracia superblock, the sidewalk and pavement are at the same level and streets are shared by all modes of travel. The Gracia superblocks involved physically cutting off some through streets entirely, but on most streets, they simply raised the level of the pavement so that it was even with the sidewalks (all means of travel share equal access), reduced the speed limit, and eliminated one-way through streets. That changed drivers’ habits. A study of Gracia before and after the superblocks found that foot travel in the area increased by 10 percent and bicycle traffic by 30 percent, while vehicle traffic declined by 26 percent in interior streets. Meanwhile, thousands of square meters of new shared public spaces were opened to residents, who quickly came to embrace them. No one ever suggests reintroducing automobile through traffic to Gracia. But it, too, has gentrified. Though it still has a robust middle-class population, there has been an enormous increase in tourism, which has brought more and more boutiques and real estate speculators. Prices are going up. The Born and Gracia projects are interesting as examples of traffic calming and pedestrianization — proof that they are popular and enduring — but they are not quite full-fledged superblocks in the way Rueda and the city now envision them. Those would come later. In 2012, the center-right administration of Mayor Xavier Trias set out to develop a comprehensive urban mobility plan for the city. In 2015, the final plan embraced superblocks — and not just a few. 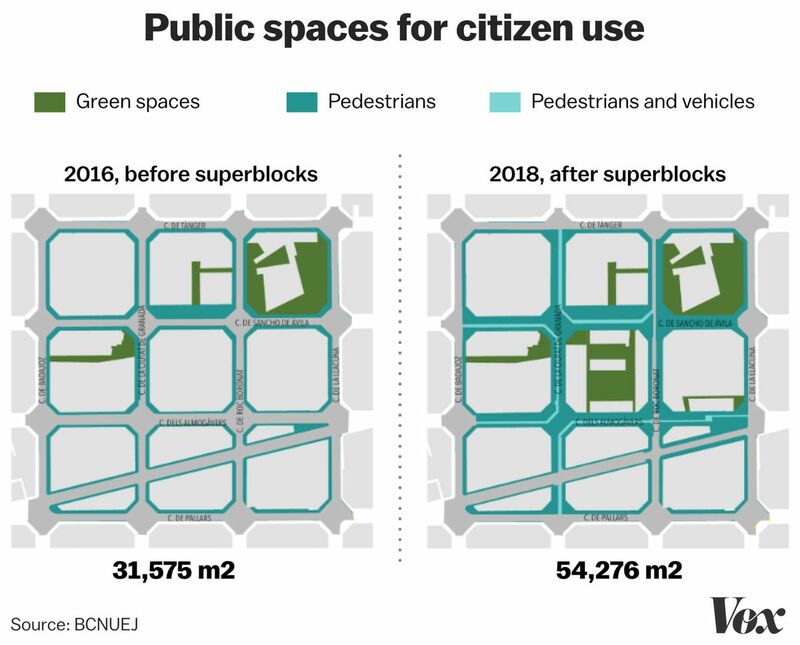 It adopted Rueda’s plan to implement 500 superblocks across Barcelona, reclaiming more than 70 percent of the land now devoted to motor vehicles. Though it adopted a radical plan, Trias’s was not a radical administration. It moved quietly and deliberately, holding a series of neighborhood consultation workshops open to the whole city, gradually developing a small list of proposed pilot projects. Then in May 2015, everything was upended by the municipal elections, which took place during a time of political unrest in Spain. The country was still suffering in the wake of an economic crisis that hit the housing market particularly hard, displacing thousands of residents and sparking a wave of grassroots activism. At the same time, there was a growing push for Catalan independence (a perpetual subject of conflict in the region). Amid the chaos, center-right and center-left coalitions fractured. To everyone’s great surprise, Barcelona en Comú (Barcelona Together, a coalition of green and leftist parties) won, gaining 11 seats on the city council to 10 for the incumbent Catalan nationalist coalition. That majority made their leader — a fiery leftist housing activist named Ada Colau, who had no previous experience in elected office — the new mayor. 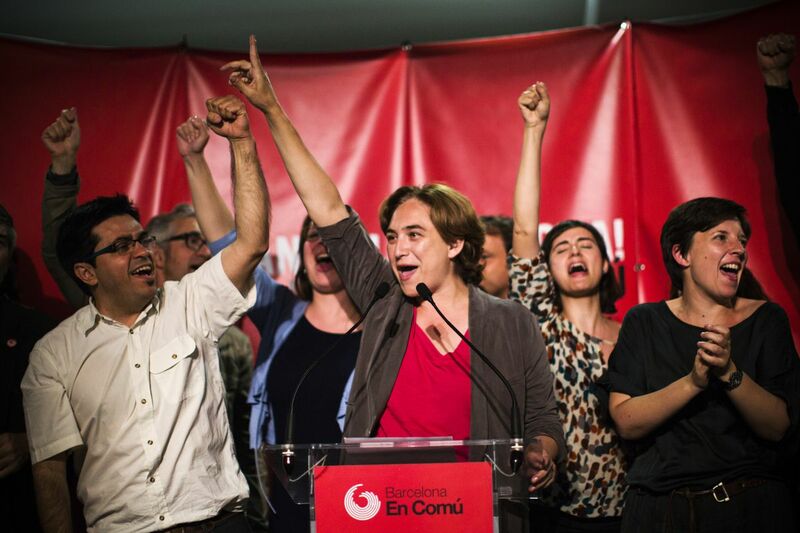 Ada Colau (center), leader of the leftist coalition Barcelona Together, celebrates her party’s victory in Barcelona on May 24, 2015. Colau’s victory was an earthquake in Barcelona politics, a sharp swing to the left just when nationalists seemed ascendant. She quickly stocked her administration with many of the activists she had worked with in the streets in previous years. She inherited the urban mobility plan and began a neighborhood consultation process of her own. Under her administration, the program was more publicized and focused more squarely on public space. The new slogan: Omplim de vida els carrers! Let’s fill the streets with life! Ironically, the jolt that put the program in the public eye (and almost knocked it off course) came not from the administration, but from Rueda. Barcelona is home to several schools of architecture, and they frequently collaborate on projects and exhibitions. In 2016, they wanted to do a project related to urbanism. They approached Rueda, he pitched them on a superblock, and together, they took the project to City Hall. Some efforts were made to let the neighbors know a superblock was coming, but they were fitful and inadequate. Flyers went out in July and the project was done in early September. Even the neighbors who read the flyers were not clear whether it was meant to be a temporary pilot project or something permanent. As a result of the somewhat rushed and unorthodox process, some residents who lived in the neighborhood, and many who lived at or near its periphery, simply woke one day to find traffic and bus routes routed around a superblock. Within the nine-block perimeter, through traffic had been cut off and speed limits radically reduced. 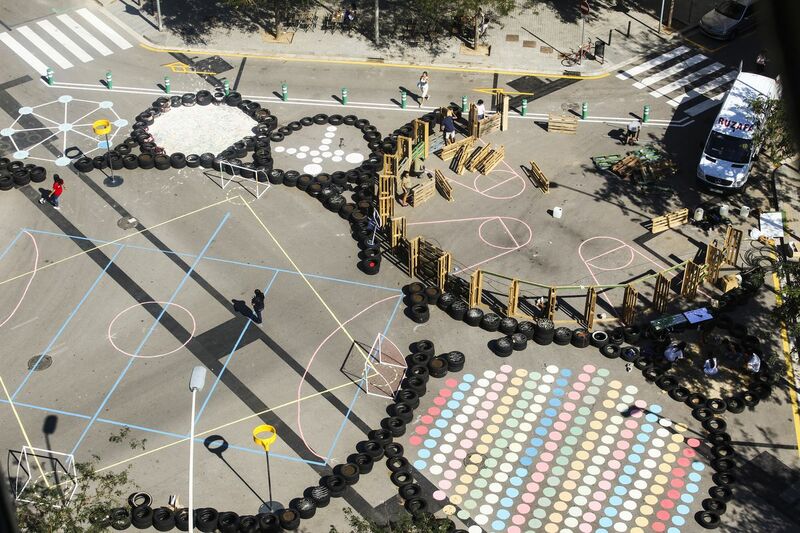 In a few intersections, the architecture students had painted designs on the ground, laid some tires down in circles for play areas, and brought in numerous potted trees to line the streets. It was fast and cheap — no new permanent infrastructure, mostly just new signs. And tires. The Poblenou superblock in its original, temporary-feeling form, in 2016. I met Campins, a stocky, bald bank union manager armed with a sheaf of maps and notes, at a coffee shop in Poblenou. He lives near the periphery and found his driving routines disrupted by the superblock. He believes traffic was pushed to the periphery, drivers were confused, and bus routes were snarled. He started a citizens group against the superblock called Association of People Affected by the Poblenou Superblock (Plataforma d’Afectats per la superilla del Poblenou), which lobbied the administration to reverse the superblock, held protests, and drew intense media attention. For the first six months or so, opposition rallied and the continuation of the superblock was in doubt. And there wasn’t much pushback. Casorrán jokes that taxicabs kept wandering in by mistake. It even took Google Maps six months to update. But as time passed, things began to change. Patrick and Silvia, a local couple with school-age children, chat in the Poblenou superblock on October 15, 2018. But things calmed down around six months in when, after intensive consultation with the neighbors, the city built a more permanent playground, planted several green areas, and put in the picnic tables. 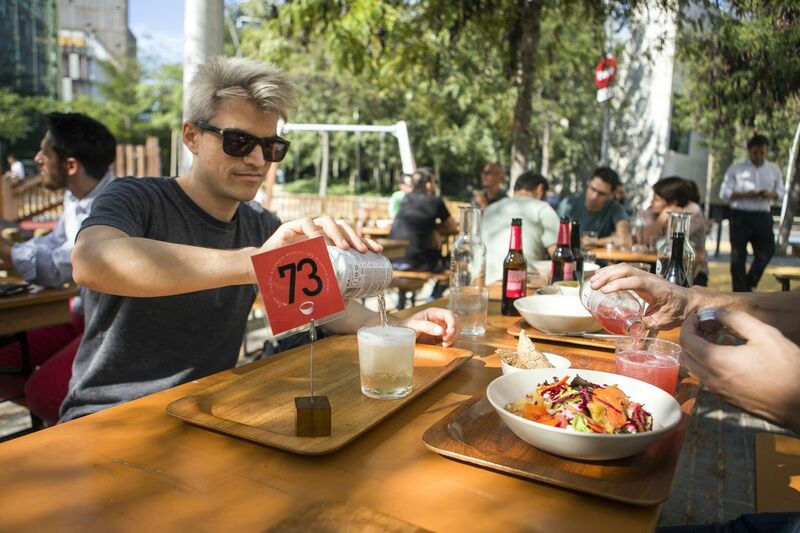 Andrés Bartos enjoys a beer at the picnic tables in the Poblenou superblock. Patrick, Nora, and Silvia, residents of Poblenou, chat in the superblock as kids walk home from school. Since then, opposition has died down and many who were initially opposed have come around. “It’s very difficult to find people against now,” says Nebot. The group formed to support the superblock has become a neighborhood association. The Poblenou superblock has not become a perfect urbanism postcard. It is, for lack of a better term, somewhat ragged. Swaths of the interior are still under development, with construction fencing at regular intervals, and the potted trees still give the whole affair a temporary feeling. A few of the streets are now empty of cars but also, most of the time, empty of people. Unlike Gracia, this area of Poblenou was not struggling with a traffic problem. With just 1,800 people, the nine-block area contains the population density of a single block of the Eixample. That’s why some critics were confused about the decision to slate this area for a superblock. Some funky architecture on the edge of the Poblenou superblock. “It was completely an ideological project,” says Campins. “They didn’t come here to solve anything.” His group is now filing a lawsuit, hoping to have a judge overturn the superblock — though he now admits he would prefer simply to make a few changes to the project rather than reverse it entirely. In a sense, Campins is correct about the ideological character of Poblenou. It very much reflects Rueda’s vision, which is coming to life through the urban plan. 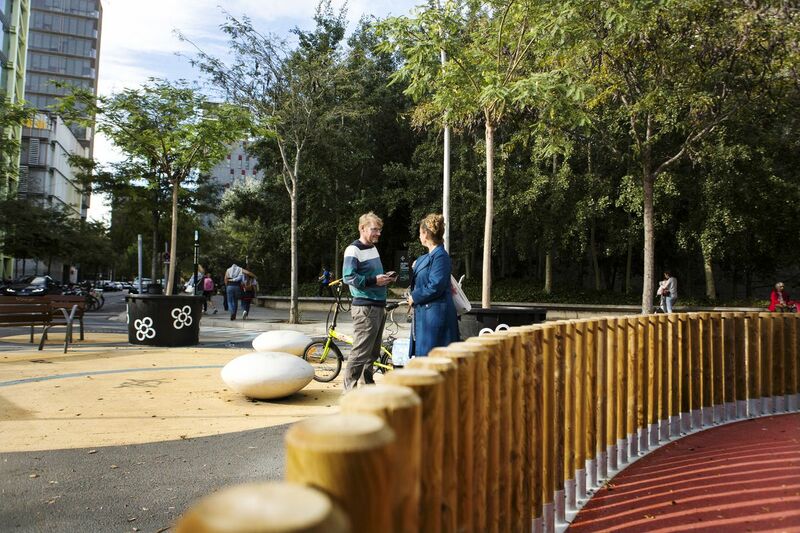 The Poblenou superblock opened up new shared public spaces. Despite the bumpy journey, the superblock in Poblenou now seems rooted and irreversible. As for the residents who enjoy a surfeit of shared spaces, they aren’t complaining. The city is learning as it goes. As it accelerates, implementing the next five superblocks, thinking about the 10 or 20 after that, it’s seeking to take what it has learned and apply those lessons to the task ahead. 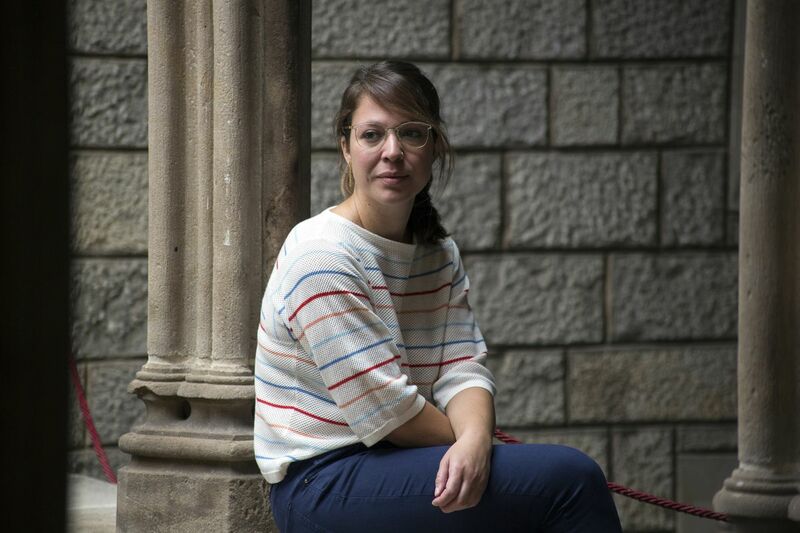 Much of that work will fall on the shoulders of Janet Sanz, who, as Barcelona’s deputy mayor for ecology, urbanism, and mobility, is overseeing the plan. She served on city council from 2011 to 2015 before joining Colau’s administration, but she’s still in her early 30s, part of a wave of young leftists shaking up city government. When I meet her, she is dressed informally, with wide, alert eyes, constantly moving hands, and rapid-patter Catalan that left my translator sweating. Janet Sanz, Barcelona’s deputy mayor for ecology, urbanism, and mobility, at City Hall on October 15, 2018. Tactical changes are fast, low-cost, and high-impact, things like changing the direction of a one-way street. Structural changes are more lasting, things like changing the level of pavement or installing a playground. The great advantage of tactical urbanism is that it can produce relatively large changes in behavior with relatively minimal investment of time and money. In Poblenou, it was used as a kind of low-level shock therapy, to kick-start the process. 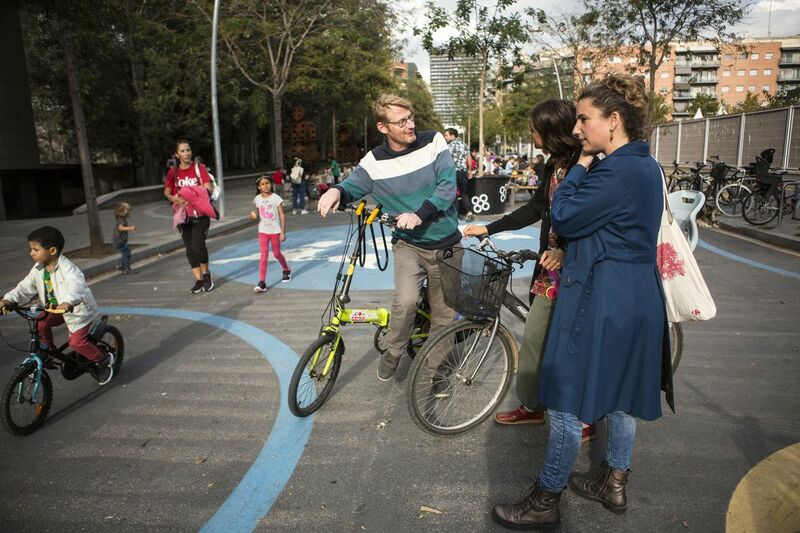 Poblenou residents were not asked if they wanted a bunch of new public space; they were confronted with it and asked what they’d like to make of it. The place of bicycles in superblocks, as they evolve. But tactical urbanism also stirred up early resistance, when there were only fast and cheap changes and no concrete promise of anything else. At that stage, the loss of driving privileges was fresh and the potential of the superblock was unclear. A few months after the superblock went in, initially through tactical, temporary changes like tires and paint, the administration began a closer consultation process with neighbors that resulted in more structural changes, including a larger playground and the beloved picnic tables, which together ran the city roughly €50,000. (The city also, in response to criticism and to some residents’ chagrin, restored one north-to-south through street.) The more collaborative process, and the more permanent-feeling changes it is producing, have mostly muted opposition. 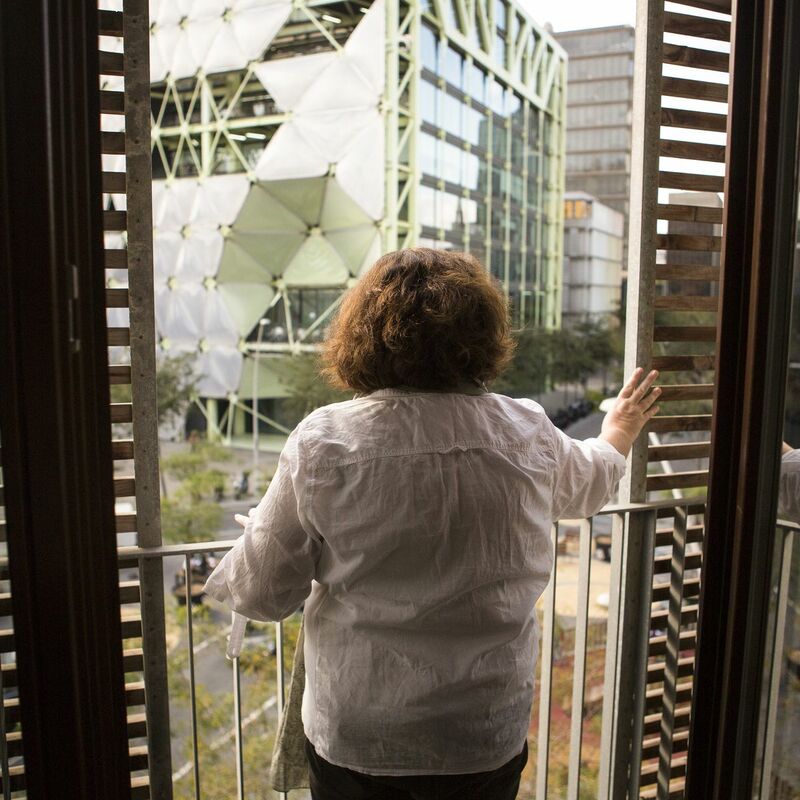 Pilar, a local resident, looks out from her apartment window onto the Poblenou superblock. Salvador Rueda, father of the superblocks of Barcelona. When he first came to visit the Poblenou superblock and saw the neighbors gathering to enjoy the space and discuss its future, Rueda “was really impressed, even almost crying,” Casorrán says. The Poblenou superblock project was, in ways both intentional and unintentional, educational for the city administration. It demonstrated that no change in urban space, especially one that deprioritizes cars, is truly safe from public backlash until permanent, structural changes have been made that benefit affected residents. But it also showed that with a little courage, the process of transforming urban space can be accelerated. It can work better to present the changes as a fait accompli and allow residents to shape rather than reject them. It just requires faith — faith that well-designed public spaces, where they can be created, will be embraced and endure. 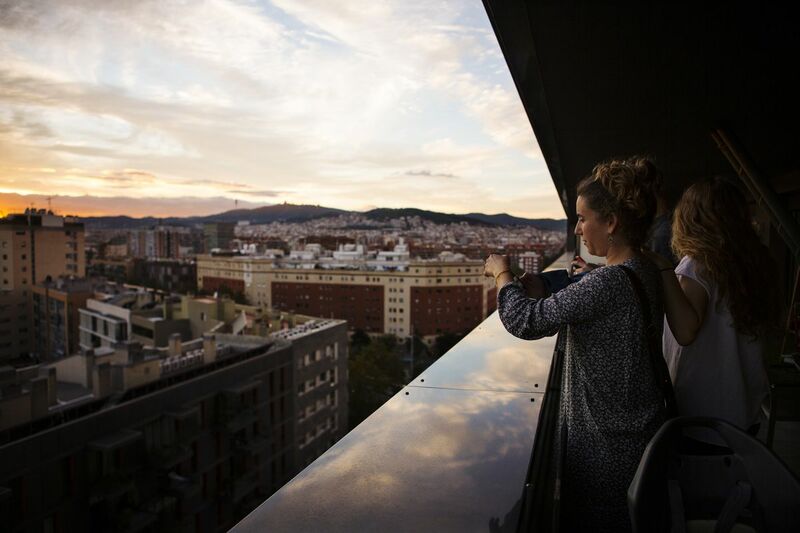 Poblenou resident Silvia Casorrán takes a picture at sunset, from an apartment perched high above the superblock. The tide of opinion is turning. 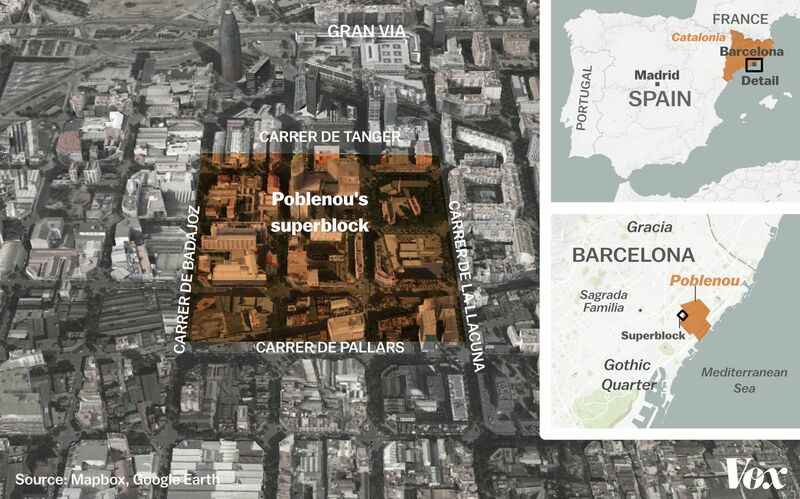 Barcelona residents can see the superblocks now; they can witness a patchwork of pedestrian areas forming. They can visit the Sant Antoni market or have lunch on the Plaça de la Revolució in Gracia. They can walk through the Poblenou superblock, perhaps on the way to the Poblenou Rambla, a wide pedestrian avenue that runs the length of the neighborhood, lined with sidewalk cafes. They can begin to envision what their own neighborhoods might look like with fewer cars. “We said, okay, okay, take it easy, it’ll get here,” she laughs. There are five superblocks underway now, moving from consultation to implementation, including in Horta on the northeast side and Les Cortes to the southwest. And there are 10 more in some stage of planning. 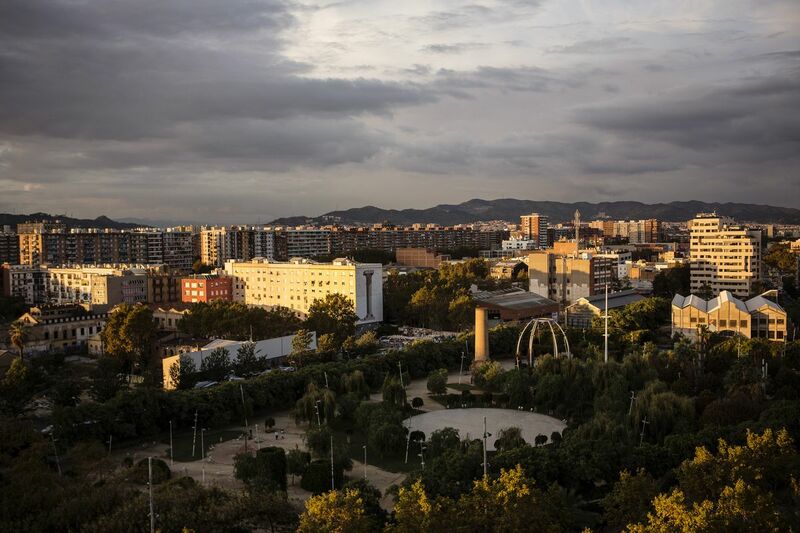 Overlooking Poblenou’s own Central Park, designed by French architect Jean Nouvel. As to whether all these repurposed streets will immediately be filled with life, Sanz says that is the wrong question. It is cars that should be asked to justify their priority in shared spaces, not people. The priority now is to maintain steady progress. Sanz hopes it will take roughly a year and a half from the beginning of neighborhood consultation to the beginning of building a superblock.